XEX files, or more accurately XEX2 files, are signed/encrypted/compressed content wrappers used by the 360. ‘XEX’ = Xbox EXecutable, and pretty close to ‘EXE’ – cute, huh? They can contain resources (everything from art assets to configuration files) and executable files (Windows PE format .exe files), and every game has at least one: default.xex. When the Xbox goes to launch a title, it first looks for the default.xex file in the game root (either on the disc or hard drive) and reads out the metadata. 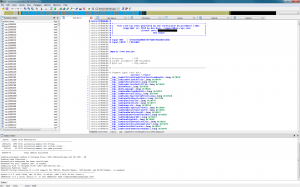 Using a combination of a shared console key and a game-specific key, the executable contained within is decrypted and verified against an embedded checksum (and sometimes decompressed). 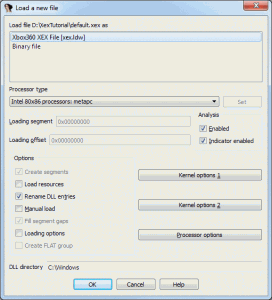 The loader uses some extra bits of information in the XEX, such as import tables and section maps, to properly lay out the executable in memory and then jumps into the code. What kind of metadata is in the XEX? How do you get the executable out? How do you load the executable into memory? The first part of this document will talk about these issues and then I’ll follow on with a quick IDA walkthrough for reversing a few functions and making sure the world is sane. There are tons of ways to get a working disc image, and I’m not going to cover them here. The information is always changing, very configuration dependent, and unfortunately due to stupid US laws in a grey (or darker) area. Google will yield plenty of results, but in the end you’ll need either a modded 360 or a very specific replacement drive and a decent external SATA adapter (cheap ones didn’t seem to work for me). The rest of this post assumes you have grabbed a valid and legally-owned disc image. Quite a few tools will let you browse around the disc filesystem and grab files, but the most reliable and easy to use that I’ve found is wx360. There are some command line ones out there, FUSE versions for OSX/etc, and some 360-specific disc imaging tools can optionally dump files. If you want some code that does this in a nice way, wait until I open up my github repo and look XEGDFX.c. You’re looking for ‘default.xex’ in the root of the disc. For all games this is where the game metadata and executable code lies. A small number of games I’ve looked at have additional XEX files, but they are often little helper libraries or just resources with no actual code. Once you’ve got the XEX file ready it’s time to do some simple dumping of the contents. The first tool you’ll want to use is xorloser’s XexTool. Grab it and throw both it and the included x360_imports.idc file into a directory with your default.xex. You’ll find some interesting bits, such as the encryption keys (required for decrypting the contained executable), basic import information, contained resources, and all of the executable sections. Note that the XEX container has the information about the sections, not the executable. We will see later that most of the PE header in the executable is bogus (likely valid pre-packaging, but certainly not after). Next up we will want to crack out the PE executable contained within the XEX by using the ‘-b’ flag. 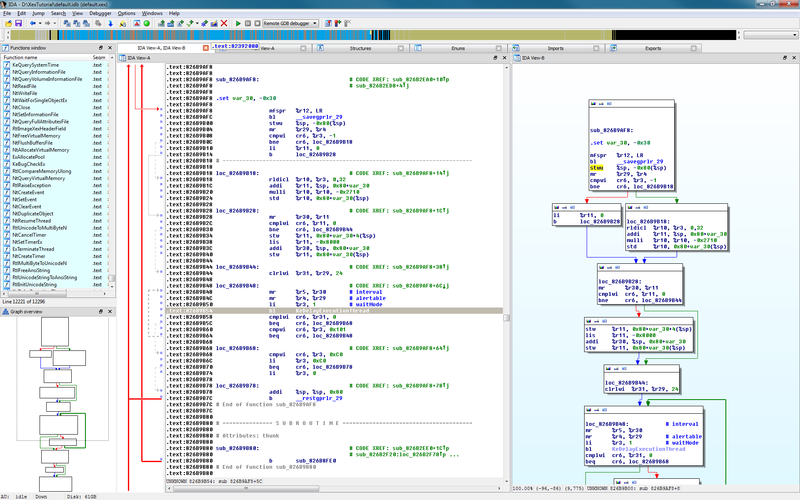 Since we will need it later anyway, also add on the ‘-i’ flag to output the IDC file used by IDA. In this case the XEX file was both encrypted and compressed. When XexTool spits out the .exe it not only decompresses it, but also pads in some of the data that was stripped when it was originally shoved into the .xex. Thinking about rotational speeds of DVDs and the data transfer rate, a 4x compression ratio is pretty impressive (and it makes me wonder why all PE’s aren’t packed like this…). Check out the results and see the PE headers. Note that most of them are incorrect and (I imagine) completely ignored by the real 360 loader. For example, the data directories and section table have incorrect addresses, although their sizes are fairly accurate. During XEX packing a lot of reorganizing and alignment is performed, and some sections are removed completely. The two most interesting bits in the resulting file from a reversing perspective are the imports table and the runtime function table. The imports table data referenced here is pretty bogus, and instead the addresses from the XEX should be used. The Runtime Function Table, however, has valid addresses and provides a useful resource: addresses and lengths of most methods in the executable. I’ll describe both of these structures in more detail later. [I'll patch this up once I open the github repo, but for future reference XEXEX2LoadFromFile, XEXEX2ReadImage, and XEPEModuleLoadFromMemory are useful] Now that’s possible to get a XEX and the executable it contains, let’s talk about how a XEX is loaded by the 360 kernel. Usually they seem to be laid out as read-only data, code, and read-write data, and always grouped together. All of the fancy sections in the PE are distilled down to these three types, likely due to the fact that the 360 has these three memory protection modes. Everything is in 64KB chunks because that is the allocation granularity for the memory pages. Those two things together explain why the headers in the PE don’t match up to reality – the tool that takes .exe -> .xex and does all of this stuff never fixes up the data after it butchers everything. When it comes to actually loading XEX’s, all of these transformations actually make things easier. Ignoring all of the decryption/decompression/checksum craziness, loading a XEX is usually as simple as a mapped file read/memcpy. Much, much faster than a normal PE file, and a very smart move on Microsoft’s part. It’s way out of scope here to talk about howthe libraries are embedded, but you can check out XEXEX2.c in the XEX_HEADER_IMPORT_LIBRARIES bit and later on in the XEXEX2GetImportInfos method for more information. In essence, there is a list of ordinals exported by the import libraries and the address in the loaded executable at where the resolved import should be placed. For example, there may be an import for ordinal 0x26A from ‘xboxkrnl.exe’, which happens to correspond to ‘VdRetrainEDRAMWorker’. The loader will place the real address of ‘VdRetrainEDRAMWorker’ in the location specified in the import table when the executable is loaded. An emulator would perform this process (a bit more efficiently than you or I) and resolve all imports to the corresponding functions in the emulated kernel. In the future it may be possible to build a library of optimized routines commonly found in these libraries by way of fingerprint and version information. For example, being able to identify specific versions of memcpy or other expensive routines could allow for big speed-ups. That’s about it for what can be done by hand – now let’s take a peek at the code! 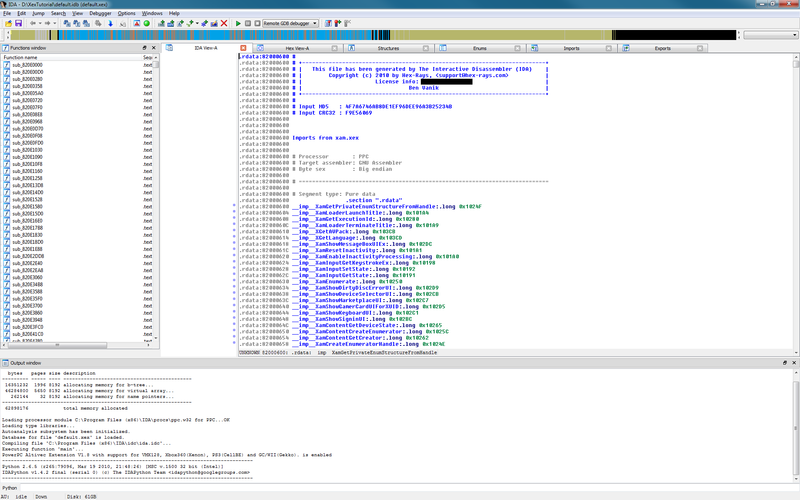 I’m using IDA Pro 6 with xorloser’s PPCAltivec plugin (required) and xorloser’s Xbox360 Xex Loader plugin (optional, but makes things much easier). If you don’t want to use the Xex Loader plugin you can load the .exe and then run the .idc file to get pretty much the same thing, but I’ve had things go much smoother when using the plugin. Install the plugins and fire it up. You should be good to go! Close the wizard window and then drag/drop the default.xex file into the app. It’ll automatically detect it as a XEX, don’t touch anything, and let it go. Although you’ll start seeing things right away I’ve found it’s best to let IDA crunch on things before moving around. Wait until ‘AU: idle’ appears in the bottom left status tray. 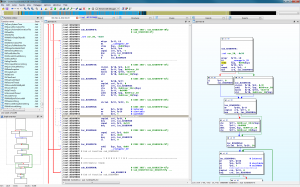 IDA and xorloser’s XEX importer are nice enough to organize most things for you. Most functions are found correctly (although a few aren’t or are split up wrong), you’ll find the __savegpr/__restgpr blocks named for you, and all import thunks will be resolved. 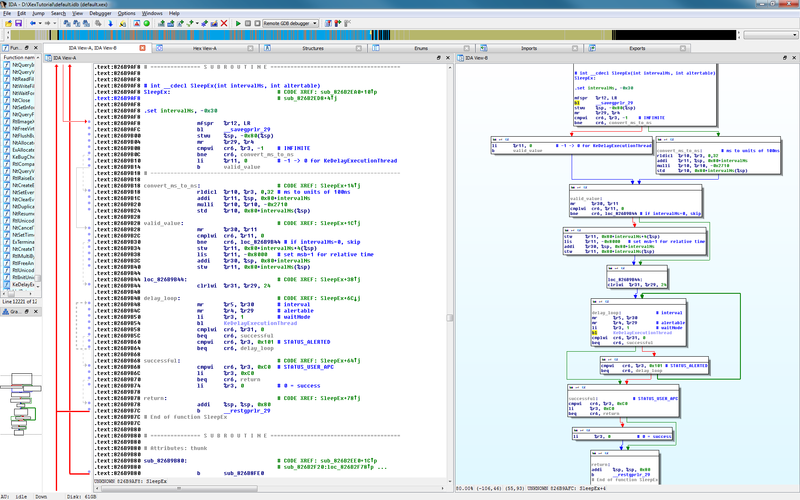 I’m not going to do a full walkthrough of IDA (you either know already or can find it pretty easily), but I will show an example that reveals a bit about what the executables look like and how they function. It’s fun to see how much you can glean about the tools and processes used to build the executable from the output! Starting simple and in a well-known space is generally a good idea. Scanning through the import thunks in my executable I noticed ‘KeDelayExecutionThread’. That’s an interesting function because it is fairly simple – the perfect place to get a grounding. Almost every game should call this, so look for it in yours (your addresses will differ). Because this is a kernel (Ke*) function it’s unlikely that it is being called by user code directly. Instead, one of the many static libraries linked in is wrapping it up (my guess is ‘xboxkrnl’). 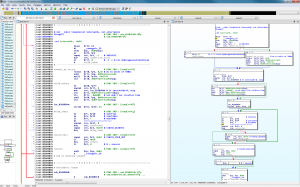 IDA shows that there is one referencing routine – almost definitely the wrapper. Double click it to jump to the call site. We can do one better than just the signature, though. This has to be some Microsoft user-mode API. Thinking about what KeDelayExecutionThread does and the arguments of this wrapper, the first thought is ‘Sleep’. Win32 Sleep only takes one argument, but SleepEx takes two and matches our signature exactly! Check out the documentation to confirm: MSDN SleepEx. Pretty close to what we got, right? Rename the function (hit N) and feel satisfied that you now have one of hundreds of thunks completed! Just so you know, there are people reading. Indeed, we are reading. Good luck. very nice info and progress …. Awesome! I’ve always had enough trouble decoding binaries in standard EXE files. Decoding something like this…beyond my capabilities. Looking forward to further posts.